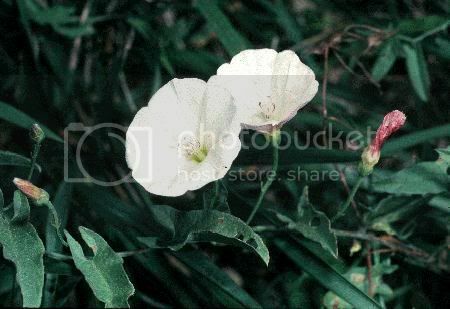 Field bindweed (Convolvulus arvensis L.) can be a pernicious weed. The weed produces a long taproot (up to 10 feet long) that generates many side roots. These side roots produce buds that can develop into new plants. Bindweed plants also produce many seeds that, with their tough seed coats, can remain viable in the soil for up to 50 years. To control established bindweed in field crops, you must deplete the roots’ energy resources by repeatedly destroying the top growth. This can be done through a combination of intensive tillage, frequent mowing, competitive crops, cover crops, and herbicides. 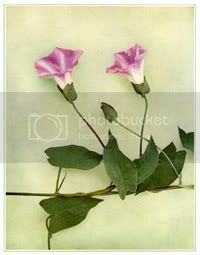 Bindweed is spread from plant pieces on tillage equipment, moved from field to field by seeds on combines, introduced by contaminated crop seed, and left on pastures when livestock are fed hay or grain containing bindweed seeds. 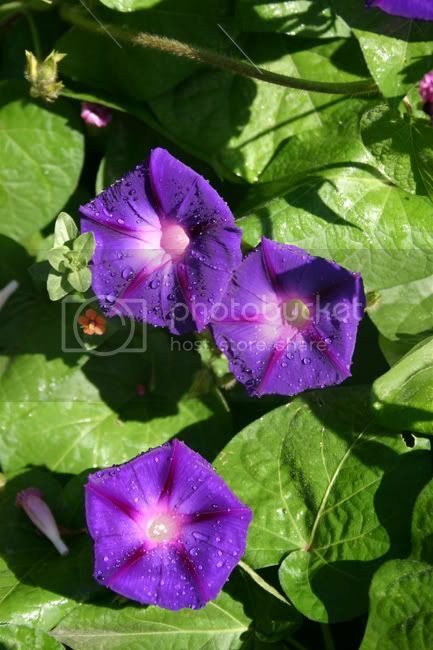 Bindweed-free fields can be kept clean by keeping out bindweed seeds or plant parts and by eliminating the spread of the weed from fields already contaminated. Grazing can also be effective. Sheep and cattle eat the leaves and stems, while hogs and chickens not only eat the leaves and stems but also expose roots and crowns, further depleting root reserves. Black plastic mulch or fabric weed barrier will stifle bindweed in high-value plantings by keeping light from reaching the ground. Typically, the weed-free area is limited to the row, while the middles are maintained with cultivation, mowing, or herbicides. It may take three to four years of light exclusion to kill the bindweed. 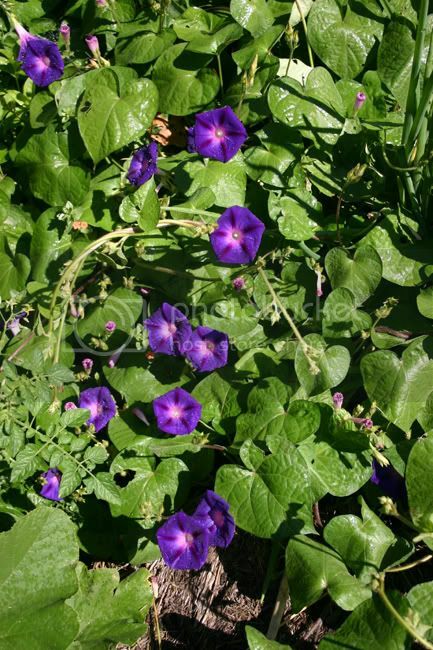 Perennial plantings or vegetable plantings previously not using either black plastic mulch or fabric weed barrier can realize the benefit of bindweed control by switching over. Fabric weed barrier is available from major horticultural and greenhouse suppliers such as A.H. Hummert, A.M. Lenard, Peaceful Valley, DeWitt Company, and Greenhouse suppliers. Black plastic mulch is typically available through wholesale farm suppliers. Growing alfalfa has been shown to greatly reduce or eliminate bindweed. The frequent cutting for hay and the smothering effect of the crop puts bindweed at a disadvantage. Hay cutting works like mowing and tillage to reduce top growth. Once cut, the alfalfa grows faster than bindweed and shades it out. Two or three years of alfalfa in the crop rotation will greatly reduce bindweed. 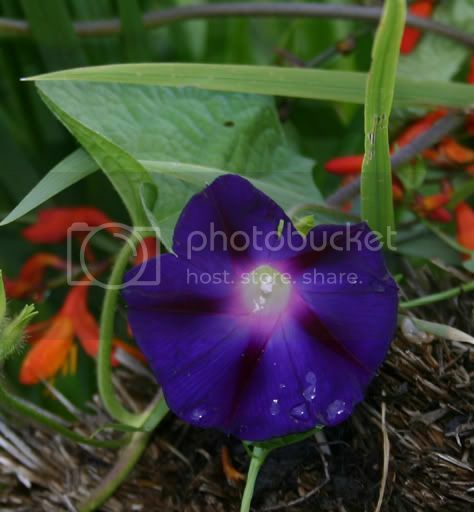 Purple Bindweed from ***MY*** Garden last year!!! Sources: attra.ncat.org/attra-pub/bindweed.html, University of Kansas, & Noxious Weeds of Klamath County, Field Identification Guide.